D-Sisyphe (pronounced as in the French ‘décisif’, meaning ‘decisive’ in English) is an important piece of performance, both as a creative expression that fuses contemporary dance with physical theatre and as an insight into the kind of socio-political situation of Tunisians that ultimately led to the 2011 uprisings that began in Tunisia and spread across the Middle East. The piece offers a humanised perspective of one man, Khmais, with his own feelings of loss and desperation at what he sees as the wreckage of his life – loathed by his wife and son, rejected by society and having lost faith in God, he is alone and afraid. 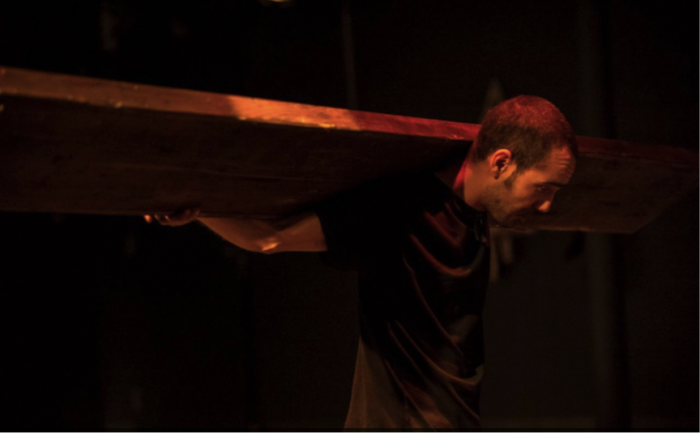 The play follows Khmais for one night at the construction site where he works, overthinking his life. Award-winning actor Meher Awachri developed D-Sisyphe as his final project at university, starting with a text he had written based upon The Myth of Sisyphus by Albert Camus. In an interview with al.arte magazine, Awachri described how the book raised questions for him “about my life in Tunisia before the revolution during the time of dictatorship, about the problems within Tunisian society and about my problems with society. Camus compares the absurdity of man’s life with the situation of Sisyphus. In D-Sisyphe I created a Tunisian version of Sisyphus”. Continue reading on the Shubbak Festival blog.